Photo by yuoak / iStock. Those who have financial assets and benefit from Wall Street’s financial games get steadily richer and more powerful. The winners use the power of their financial assets to buy political favor and to hold government hostage by threatening to move jobs and tax revenue to friendlier states and countries. The winners then use this political power to extract public subsidies, avoid taxes, and externalize environmental, labor, health, and safety costs to further increase their financial returns and buy more political power. Most of us have been conditioned by corporate media and economics education—along with the basic fact that we need money to buy the things we need or want—to accept the pervasive, but false, claims that money is wealth and a growing GDP improves the lives of all. It rarely occurs to us to challenge these claims in our own thinking or in conversations with friends and colleagues. So they persist and allow the corporate establishment to limit the economic policy debate to options that sustain its power. We are living beings born of and nurtured by a living Earth. Life exists—can exist—only in living communities that self-organize to create the conditions essential to life’s existence. Money is just a number, an accounting chit we accept in exchange for things of real value because we have been conditioned to do so almost from birth. We who work for peace, justice, and sustainability have the ultimate advantage. Truth is on our side. And the deepest truths, those on which our common future depends, live in the human heart. Let us each speak the truth in our own heart so that others may recognize and speak the truth in theirs. Together we will change the human story. 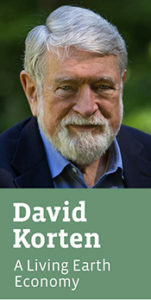 David Korten wrote this article for YES! Magazine as part of his new series of biweekly columns on “A Living Earth Economy.” David is co-founder and board chair of YES! Magazine, president of the Living Economies Forum, co-chair of the New Economy Working Group, a member of the Club of Rome, and the author of influential books, including When Corporations Rule the World and Change the Story, Change the Future: A Living Economy for a Living Earth. His work builds on lessons from the 21 years he and his wife, Fran, lived and worked in Africa, Asia, and Latin America on a quest to end global poverty. Follow him on Twitter @dkorten and Facebook. The fact that money commands value – and enormous value at that – is the basis for a lopsided economic development. For a total change in the economic system, the money value should be at least limited to exchang of goods and services and accumulation of capital should not multiply itself. Rosa luxumberg has extensively dealt on the subject.